The 10 Best Live Music Venues in Kansas! There’s no place like home for some of the best music in the country. Kansas hosts a variety of musical events and spaces that you really won’t find anywhere else. With unique floor plans and intimate spaces to get up close to your favorite performers, these 10 Kansas music venues will give you a night to remember. This music venue is in the middle of Wichita's foremost entertainment district, Old Town. An outdoor music venue that features live music, local and national bands, every weekend and occasionally on weekdays. Connected to the restaurant, Public, which is open year-round, the concert venue is closed through the winter months. A four-day outdoor country music concert festival, said to be the largest in Kansas. Held every summer in June at Turtle Creek Lake, north of Manhattan. Concert goers usually camp during the festival at one of the 2,400 camp sites available. Top name country performers headline the concert, along with top local music artists. White Concert Hall on the campus of Washburn University has been reported to be one of Topeka's premier performance venues. Hosting all Washburn music department concerts, the Topeka Symphony Orchestra, the Community Concerts Series, the Sunflower Music Festival and several other university and community events which cover all music genres. A large modern, state-of-the-art entertainment venue, located in the heart of downtown Wichita. Each year the arena features top performers who take the stage in front of 15,000 seated guests, and features 22 suites, 40 loge-boxes, and 300 premium seats. 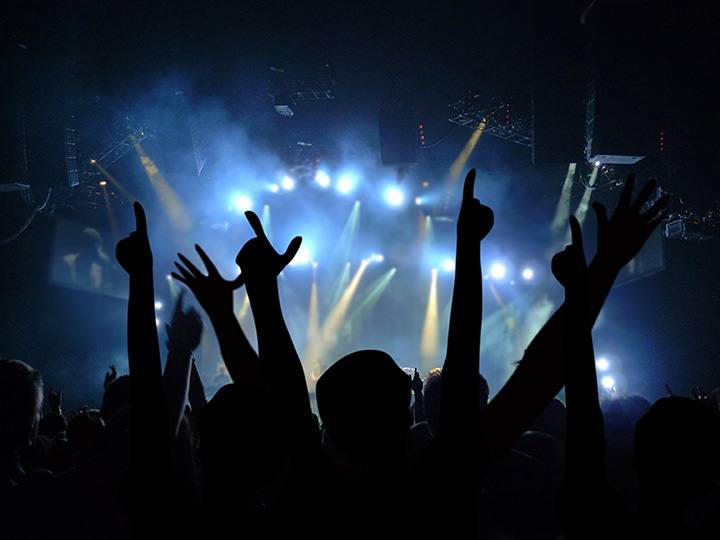 Top artists perform on stage using the industry's best acoustics and sound system. Built in 1929, in the Spanish Colonial Revival style. The Emporia Granada Theater is home to live music events throughout the year. The unusual floor plan makes it excellent for banquet or theatre-style seating. Standing the test of time, the CL Opera House offers a diverse line up of entertainment, as diverse as the building materials it took to rebuild this cultural edifice. Located in the "heart" of Junction City, and known as the “Jewel of the Prairie,” this performing arts house continues to entertain patrons throughout Kansas. Known as one of the largest open-air amphitheaters in the United States with a seating capacity of 18,000 with 3,100 reserved and box seats. A seasonal outdoor concert venue and a haven for music lovers. The theater hosts some of the best-known entertainers in the music industry. The beautifully renovated historic Stiefel Theatre is known as the cornerstone of Salina's historic downtown district and home of the Salina Symphony. A great place to enjoy quality shows from a wide variety of genres that include: classical, blues, rock, country, alternative, etc. The Fire Escape Coffeehouse was founded by high school and college students almost 20 years ago, who were wanting a safe place to hang out and listen to Christian music. Today this ministry still provides concerts and music and maintains a Christian music radio station. Their motto, "Preach the Gospel every day; and, if necessary, use words." View more Kansas Live Music Venues.